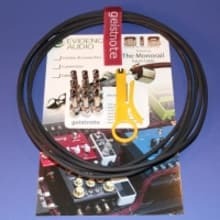 Geistnote specializes in recording cables, ribbon microphones, guitar cables, and DIY kits. We are an Authorized Dealer for: Evidence Audio, Lundahl, Cinemag, Edcor, Sowter, and Gotham Audio. Geistnote offers a variety of DIY kits and assembled products. We also offer custom solutions for your ribbon microphone, pedal board, and cable needs. We have CNC and 3D printer capabilities. The owner, Kevin Geist, is an engineer by day (computer science, aerospace) and a musician at every other waking moment. Armed with a small lab of professional measurement and fabrication equipment, he can help you build anything you require. Returnable within 14 days of delivery. Returnable within 7 days of delivery.